The 3BLM exterior surface mount metal control station and has 3 buttons (Open/Close/Stop) that control a commercial garage door opener and is equipped with a keyed lockout switch. Additionally, it is NEMA 3R, 4 and 12 rated. 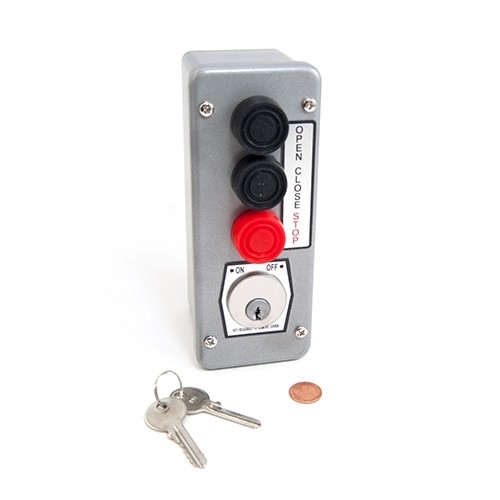 The 3BLM exterior Open/Stop/Stop 3 button control station with with a keyed lockout switch that is used to operate gate openers and garage openers from a distance with a simple push of a button. Simple to install, they can be used to operate anything from a single gate to multiple gates or doors on your property. Wire is run to the open/close/stop relay on your garage door opener or gate operator and this one is key lockable for securing and entrance after hours or when access needs to be controlled.